Wow... Are you surprised or what? An actual update. I guess I've been going through a mid-life crisis. I feel, like Disney World was a thing of my past with a teeny tiny sparkle of it left in me. Sometimes I wish I could go back to Disney but at the same time I feel like it's not the same. This week I was fortunate enough to come across 2 Epcot items...one vintage and one very unique. The first thing I found this week was a Pin holder...shaped as Spaceship Earth with the park name on top. It is from a Pin Celebration event in 2002..It is very unique because a.) I've never seen anything like it before...and b.) 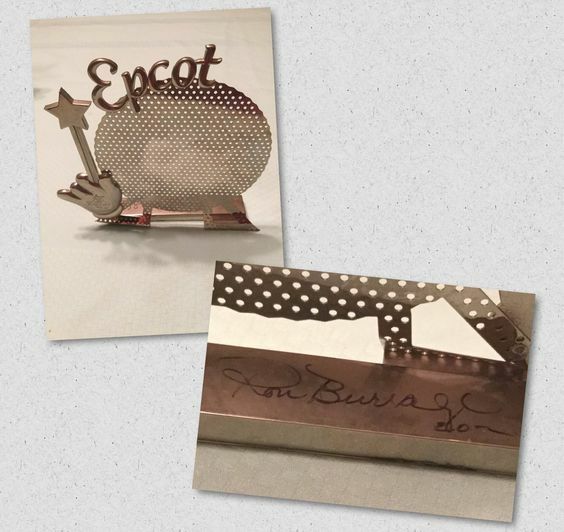 It is signed by a Former Disney designer...Ron Burrage who now works for Hershey (which is pretty cool). It is a bit bent, but still I like it. GLASSES!! OMG. They have Walt Disney World Epcot Center written on one side and the designs are actually in good shape, not worn off...although the people at the thrift store put the price tag on the words on one, where the ink did indeed come off (a little)...but still in good shape.